Arthur Lake is found along a maze of logging roads to the northeast of Falkland, but can be accessed by most two-wheel drive vehicles. The 75 hectare (185 ac) lake is known for its good numbers of stocked rainbow trout, which are best caught on the fly in early June. However, fishing stays good throughout the summer, as the lake is high enough to stay relatively cool. And if you aren’t having any luck at Arthur, Bolean and Spa Lakes are both found nearby for more stocked rainbow opportunities. This small and very scenic lake is hidden in the hills to the east of Vernon, accessed via a winding gravel road. Stocked with brookies that can grow up to 1 kg (2 lb), Becker Lake is best fished in the spring and fall, or through the ice in the winter as the water tends to get quite warm in the summer. There is a recreation site with a boat launch and a campground on the lakeshore, so you can choose to stay the night at the idyllic forest-lined lake and catch some more brook trout the next day. 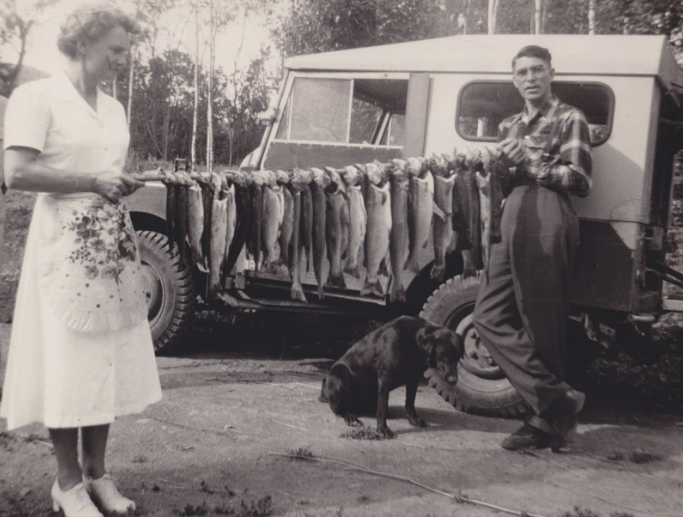 Fed by 55 different underground springs, Echo Lake is a natural spawning ground for both lake trout and kokanee. The lake is also stocked each year with 20,000 rainbow and Gerrard rainbow trout, creating an excellent fishery. Since the lake is full of shrimp, the fish tend to grow to a large size, with rainbows reaching 4 kg (9 lb) and some lake trout reaching 5 kg (11 lb). Just be aware that the lake is in a provincial park, so extra regulations may apply. Located in the breathtaking backcountry to the east of Enderby, this lake is indeed hidden from most travellers. A winding road leads you through the beautiful forest to this excellent rainbow fishing lake, with stocked trout often reaching 3 kg (6 lb). Fly fishers like to target the outlet stream at the lake’s north end, as well as the several creek estuaries at the south end. There are also three campsites found along the lake’s shores, so you can set up camp and soak in the beauty of Hidden Lake for the whole weekend. Found along the Chase-Falkland Road, which makes for a great scenic drive even without stopping to fish, Joyce Lake is a small 8 hectare (20 ac) lake that offers some surprisingly good fishing for stocked rainbows. Just 2 km up the road, Pillar Lake is a larger waterbody that offers good fly-fishing, bait fishing and trolling for stocked rainbow trout that are usually caught in the 1 kg (2 lb) range. This lake produces particularly well in May and June. Known as one of the most productive fisheries in the Okanagan, this pristine wilderness lake holds multiple sportfish species including rainbow and lake trout, kokanee and dolly varden. The lake trout are known to reach up to 7 kg (15 lb) and are found in the lake’s many deep pockets. From late July to September, the lake also presents a unique opportunity for chinook salmon fishing, primarily around the mouth of the Shuswap River. Numerous campsites and boat launches line the lakeshore, making this a great family fishing getaway. Dolly Varden, kokanee, lake trout and rainbows can all be found in Mara Lake, with lake trout reportedly reaching 8 kg (18 lb) on occasion. The kokanee fishing can be especially good through the late summer and early fall, and trolling may be your best bet. Luckily, there is a resort and a provincial park on the lake, offering full facilities including a boat launch. This easy-access lake is found just north of Vernon and make the perfect addition to your Okanagan fishing checklist. While this lake is better known for its boating and beaches than for its fishing opportunities, the 135 km-long lake offers plenty of angling action. Rainbow trout and kokanee are the main attraction here, with rainbows reportedly reaching over 9 kg (20 lb), but the lake also holds carp and whitefish. Although the fishery in Okanagan Lake is not what it once was, largely due to the introduction of shrimp who compete for food with the kokanee fry and overfishing, recent efforts by conservation groups and the government are helping to restore fish populations. 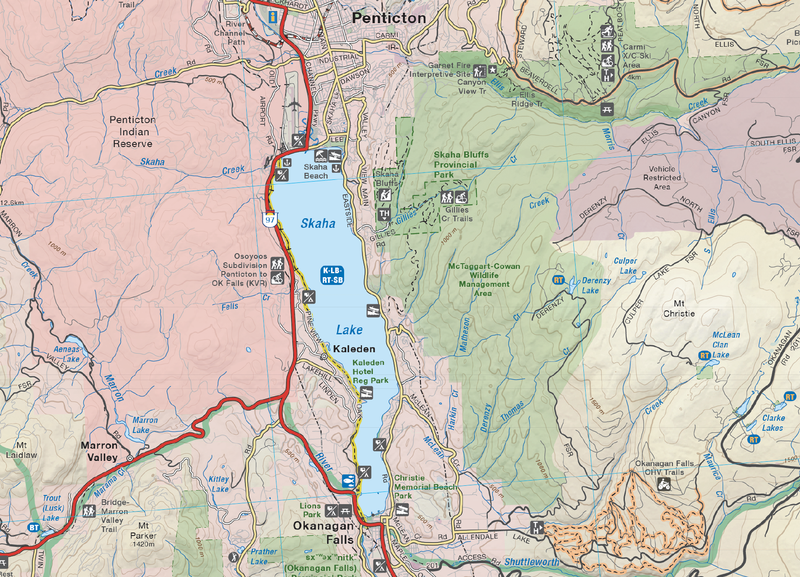 With so much lake to explore, it is well worth it to drop a line here – just watch out for the Ogopogo. Found in the hills above the much larger Kalamalka Lake, Oyama Lake requires a four-wheel drive vehicle to reach but is well worth the effort for anglers. Stocked with rainbow trout that are reported to reach 3 kg (6 lb), the lake is home to numerous islands, sunken islands, and inlets, giving you plenty of structure to target. Fly-fishers in particular like to focus on the islands, with the spring caddisfly hatch being the most productive time. Found along a forest service road south of Falkland, Pinaus Lake is part of a chain of lakes that all offer some great fishing. The lake offers camping and a resort and is stocked for rainbows that are known to reach 3 kg (6 lb) in size, but it is the variety of lakes here that is the real draw. Square, Lady King, Will and Little Pinaus Lakes are all found nearby, offering a variety of trolling, fly fishing and ice fishing opportunities. If one lake is not producing, another is just a hop and a skip away. This is a large, deep, many-armed lake that has seen a dramatic improvement in fishing in recent years, thanks in large part to some stringent conservation measures. 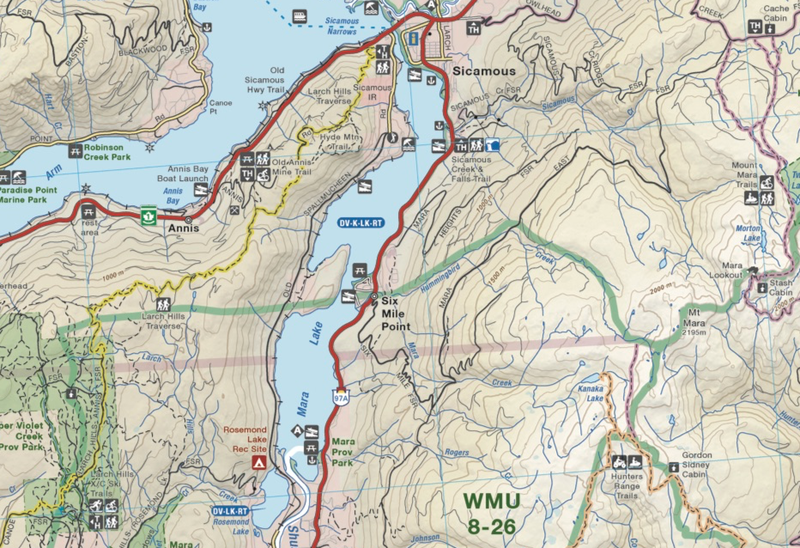 While this does mean that there are a ton of regulations to navigate (Shuswap is known as BC’s most regulated lake), it also means you have the chance to catch some rainbow and lake trout up to 10 kg (22 lb) in size. 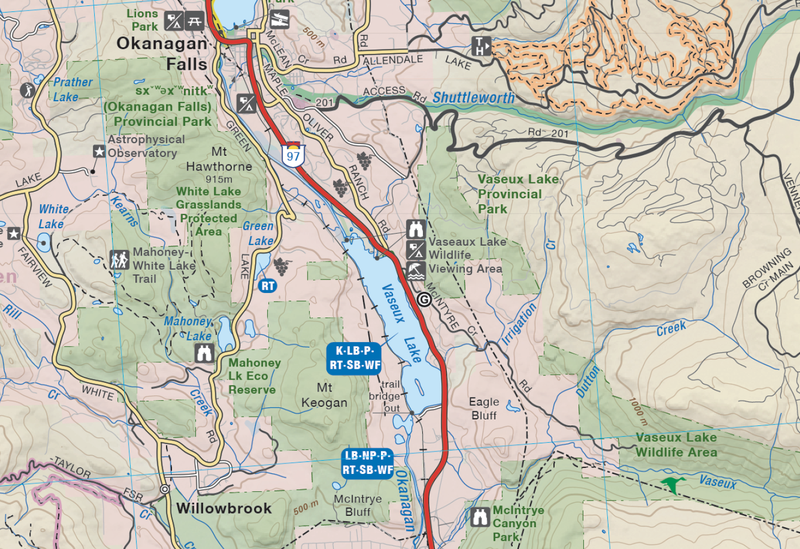 And since Shuswap is such a popular recreation lake, there is no shortage of access points to launch a boat, or beautiful beaches to stop at for a shore lunch. Like most lakes in the Okanagan, Skaha can get busy with boaters and beach-goers. Nevertheless, there is some excellent angling to be had, with plenty of trolling opportunities in the deeper sections and spincasting in the shallows. Kokanee and rainbow trout are a big attraction here, but there are plenty of other species including burbot and carp. Additionally, the lake is known as one of Western Canada’s best bass fishing lakes, with both big and smallmouth bass found here in abundance. The weeds at the lake’s south end are a particularly rich bass habitat. With crystal-clear water, large marl shoals and stocked rainbows that can reach up to 6 kg (13 lb), White Lake offers a quintessential Okanagan lake fishing experience. The marl shoals create habitat for a lot of aquatic bugs, which in turn provide lots of food for the trout. Fly-fishing in particular is a major draw to the lake, and it can be equally productive in the winter after the ice has reached a safe thickness. With easy access and a newly built boat launch and dock, there is no excuse not to drop a line in White Lake. There are no powerboats allowed on Vaseaux Lake, leaving it wide open to paddlers and shore fishers. Found along the Okanagan River, this lake has built a reputation as one of BC’s best bass fishing lakes, especially for largemouth. These fish usually weigh in around 2 kg (5 lb) but can reach up to 4.5 kg (10 lb). In addition, you are likely to find carp, kokanee, perch and rainbow trout here, so your options are plentiful. With Highway 97 running right alongside the lake and a provincial park campsite found nearby, this is a must-stop lake on your Okanagan fishing tour. You can find your way to these and many more fishing hot spots with the help of our Backroad Mapbooks and Backroad GPS Maps. 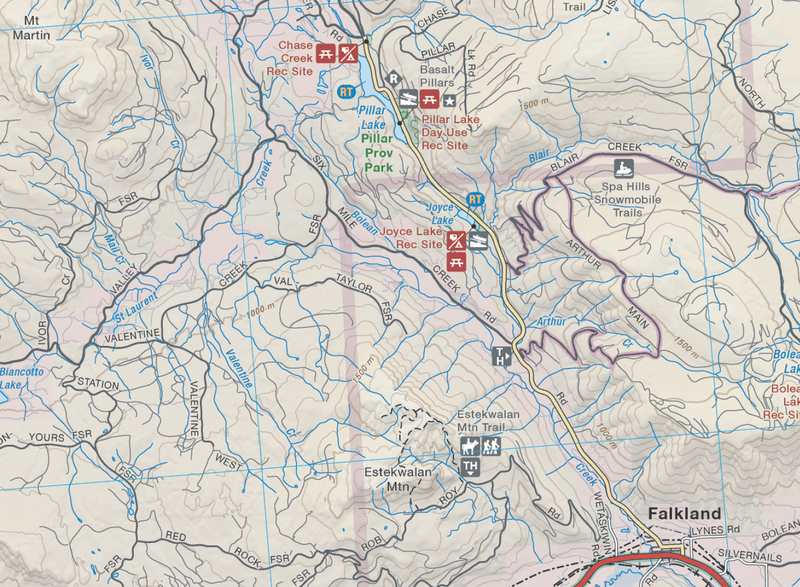 No other map product gives you the breadth of road coverage that ours do, helping you find that secluded, unobstructed viewing area with ease. Click here to order one online or use our store locator to find a Backroad Mapbooks retailer near you. Did we miss your favourite fishing hole? Let us know in the comments below or share your biggest catch with us on Instagram using #brmblife for a chance to be featured on our feed and win prizes.